It would have been three weeks in a row to have a rainy Sunday morning if last night rain lingered. But it didn’t, and boy, did it turn out to be a beautiful morning! This totally made our practice, and it showed on everyone’s face. In addition to the great weather and happy faces, we had a couple of new athletes joined the practice today: Shannon and Jorge. They both did track in the past, and we could tell. We would love to have them come to our practice regularly. The track and grass were still wet from last night’s rain, and it totally made our wet shoes squeak while running. 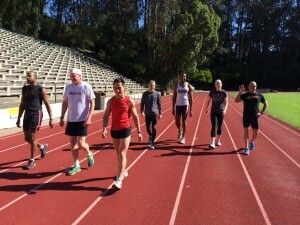 After the warm-up drills, we had everyone do 2 x 450m and 4 x 250m at 50% to 75% effort. Last 50m was meant to train everyone’s mental strength, as well as physical endurance. Great running, everyone! See you next week. Board of Directors met last week and started to create a budget for the year. A couple of big line items are Scholarships for Gay Games and hiring a coach. We would like to finalize the budgeting process and get board approval in the next meeting, so that we can let Scholarship application process started in March. First contact has been made with a candidate for a coach position. Chris Goodwin is driving the process and will try to get him out to the track to meet with everyone. 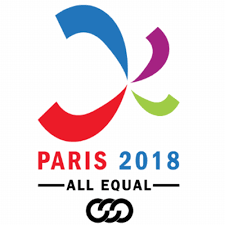 Due to Gay Games, we have high level of expenses this year and would like to ask everyone for creative ideas to fund the club’s events and activities. Let any of the board member know if you have good ideas. Sara Lewinstein, widow of Dr. Tom Wadell, will be at Frontrunners Saturday morning run this coming week. She will be there to promote Gay Games and everyone is welcome to come meet her.